The memories of a glorious day by the sea are still with me as I find myself humming along to a certain little ditty; you know the one don’t you, something about marrying a lighthouse keeper and living by the sea? There, now you won’t be able to stop humming it either. Lighthouses are on my mind, obviously. There isn’t one at West Bay but seeing all the storm damage firsthand made me think of all those lighthouses along the coastline of our poor, battered Isle which must have given such comfort to those out at sea at such perilous times. There is another reason that I am in a ‘lighthouse’ state of mind which I will go on to explain shortly. Firstly however, and I am rather embarrassed about this, I am very sorry that it has taken me so long to get this post out (didn’t happen yesterday, WordPress gremlins on the march again). Actually, this is the first of a set of three awards posts, all to follow one after the other. This is because I have been nominated for an amazing selection of beautiful awards (since Christmas) for which I am extremely thankful and which leaves me so very humbled but I love to be in the rather wonderful position of being able to share this incredibly generous bounty of treasure with as many of you as I can. Besides, what better time than the present to hand out some awards? Time for some brightness and cheer, time to celebrate. After all, the Olympics are in full swing, we have had the BAFTA’s and The Academy Awards are coming soon so it must be award season. Blogging, as I have said many times before, has brought with it a whole new community of friends from all over the world who support, encourage and inspire me and many others greatly. In so doing, they help lighten the load by shining their unique brand of love and care into the darkness. In turn, my hope has always been that through sharing my thoughts, stories and photographs here with you I have been able to send a little of that same light right back at you. What better way to illustrate this than with the enduring image conjured up in our minds when we think of a Lighthouse with its comforting beacon of guiding light beaming out into the wild, dark night? Irene’s blog is a delight to visit, packed full of her wonderful stories, both memoir and fiction, haiku poems and other writing challenges as well as her incredible photographs from her many adventures of a life well lived and travelled, and still doing so! Do take a look at her blog and you will see what I mean. Three ways I like to help people? Helping others begins in the heart and in the home I believe and so how to list three distinct ways? I can’t. I simply hope that in my every day life I can be as helpful to others as I can be. Even when I don’t feel like it. Now for the hard part. Who to nominate? Whose blogs bring light into a dark world? I can think of so many but I eventually decided to nominate those who have impacted me by shining there unique light into my darkness in a very personal way. I wanted to take the time to say something special about each of them. 2. Maria at Lost in the Labyrinth – Maria writes her powerful, honest and truly poetic blog, sharing her personal challenges, struggles and victories unique to someone living with Asperger’s Syndrome. Maria is only a couple of years older than Aspie D and she and I have forged a strong friendship through our shared struggles from ‘both sides of the coin’. She shines her light into the black days of those who also live with ASD and on a very personal level for me as a mum as she never fails to remind me that I am doing alright even when I feel that I am doing it all so very wrong. 3. Steven at moodsaplenty – Steven is a great pal of mine and he and I share a good deal of silly banter as some of you may have read but it isn’t all fun and games. Steven suffers from bipolar disorder and I want to give this award to him because he never shies away from sharing on his blog the hard-hitting reality of the way this disorder heavily impacts him on a daily basis. In this way, he shines his very personal light into the dark world of mental illness and I have nothing but the deepest admiration for him for doing so. 4. Bev at moggiepurrs – Bev’s blog is all about cats and her love of all cats, the care of them, every aspect of a cat’s life in fact, domestic or not. She shares stories from her work at her local cat shelter, and the sad reality of the plight of strays and unwanted cats, so shining her light on the importance of responsible cat ownership. Bev never shies away from hard-hitting subjects such as declawing. She takes a very firm stand that this barbaric act should be made illegal in the States where it is still practiced by certain Vets. Not only that, but Bev is an all-round lovely lady and friend, always ready to help with any blogging questions and I can honestly say that my blog wouldn’t be the same without her. 5. Jennifer at Chopping Potatoes – Jennifer is another blogging friend who I’m proud to have known since my early blogging days. She is a writer who has battled postpartum depression after the birth of her third child and she has written many excellent articles about her personal struggle with this debilitating mental health issue on her blog. I would like to nominate Jennifer for this award because she has helped many who have suffered in the same way by shining her light into this excruciating darkness. 6. Michael (‘Nav’) at The Mirror – Nav is a great guy who has become a really great friend. He shares his writing journey with us as he prepares to publish his first book, but not just any book. This book is about a corrupt system that saw his children turned against him during his ‘divorce from hell’. Nav doesn’t pull any punches and by writing his book he hopes to shine his light into the black hole of despair that fathers find themselves so often sinking into when they are deprived of their children and their love. 7. Michelle at Rising Woman – I would like to nominate my friend Michelle for this award because she shines her light into the abyss of alcoholism with all its pain and suffering and by doing so, brings hope to countless others. She is one of the most courageous women I know, sharing as she does in her take-no-prisoners style of writing about her nine years and counting of sobriety, real enough to know that addiction never goes away and describing herself as a ‘non-practicing alcoholic’. She is a published author, wife and mother and she is also a cancer survivor. Michelle found my blog when I was a very new blogger and has never left. In Michelle I see the hope and the possibility that a precious life can be saved from the all-consuming grip of alcoholism. In her I see what I once believed I would see in my dad but was not to be. 8. Susan at Susan Irene Fox – Susan is a gem of a lady with a heart of gold and friendship who has done nothing but encourage and support me and many others. She shares her unique and very personal story on her blog through her faith-filled ministry which shines with the force of forgiveness, reconciliation, redemption, hope and love. Susan’s light shines in a world that desperately needs strong, courageous women like her, a woman with a tender and gracious heart and a true love and desire to help others. 9. Alana Munro – Alana is a new blogging friend. She is a published author and blogger who supports and inspires others as she shares her writing, blogging and marketing journey but she also shines her light into the dark world of depression by writing about the way it is so often incorrectly perceived. In this way, she does indeed support and inspire many, me included. My deepest thanks go out to every one of you and many congratulations on your nominations, which I sincerely hope you will accept as you deserve it. 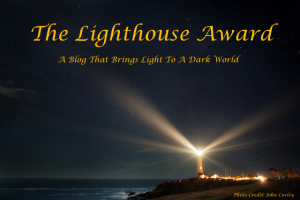 This entry was posted in Awards and tagged Alcoholism, Awards, Bipolar, Blogging, cats, depression, Friends, Friendship, hope, Lighthouse Photo, love, Postpartum Depression, The Lighthouse Award. Bookmark the permalink. You so deserve this award 🙂 Thanks for making my days a little brighter. Congratulations to you Sherri, you are wonderfully deserving! Oh, I love lighthouses, Sherri. I’ve always wanted to write a story centered around a lighthouse. Congratulations on your award, it is well deserved. Honestly, I don’t know when you sleep! Me too Jill, I really do! You must write that story, and when you do I would love to read it! There is something very emotive about lighthouses and all that they represent. Now you have my wheels turning, Sherri…thanks! That’s great Jill, I’m so glad and excited for you! Congratulations on your award. How wonderful for you, and such a lovely reflection on your writing!! Congratulations, Sherri! This particular award looks especially good on you. Let the drums rolls. Congratulations, Sherri. This award fits you perfectly! Congratulations on your Lighthouse Award, Sherri. You truly deserve it. well done with your award and also thanks for introducing us to all your own nominees – what an inspirational bunch you and they are. Ahh, thanks so much Jenny, and yes, they are all truly inspirational in their own unique ways. Congratulations Sherri. I love lighthouses but I don’t know the song either, so I second Jenny’s request 🙂 Your nominations are heartfelt and thoughtful, making me realise how many people are out there making a real difference by what they write. Thank you very much Andrea! Me too, I love lighthouses. I wanted to take the time to write about each blogger and I’m glad that you and others here have been inspired by their stories. I shall do my very best. First, thank you and bless you. I am humbled to be included in this array of wonderful bloggers. Second, you deserve all the awards for which you are nominated. Third, my blog site is now award-free (see under the “Notices” tab); however, that does not diminish the appreciation I feel. I am already a follower of three of your nominees, and will be a follower of a few more, I can tell already. I think it is a passion – a mission if you will – for those of us use our blogs to spread light. There is already so much darkness in the world: hatred, depression, anger, abuse, discouragement, cynicism, to name a few. If we can be a small light that illuminates even for a moment, we may be able to light a wick of hope, brighten a heart, and extinguish the dark in just one life. Bless you for being a candle, lamppost, a lighthouse. And thank you again for the nomination. Ahh, thanks so much Maria, you really do keep it real and know just what it’s like. My daughter has admitted that she is harsher with me than anyone. We do have a very close,loving relationship though and I’m glad that she can be her true self with me, even if that means we have our battles at times 😉 You have helped me understand where she is coming from so much better and I can’t thank you enough for that. It was said of Eleanor Roosevelt that she would rather light a candle than curse the darkness. It is right you should get these awards, S. You light candles for us. 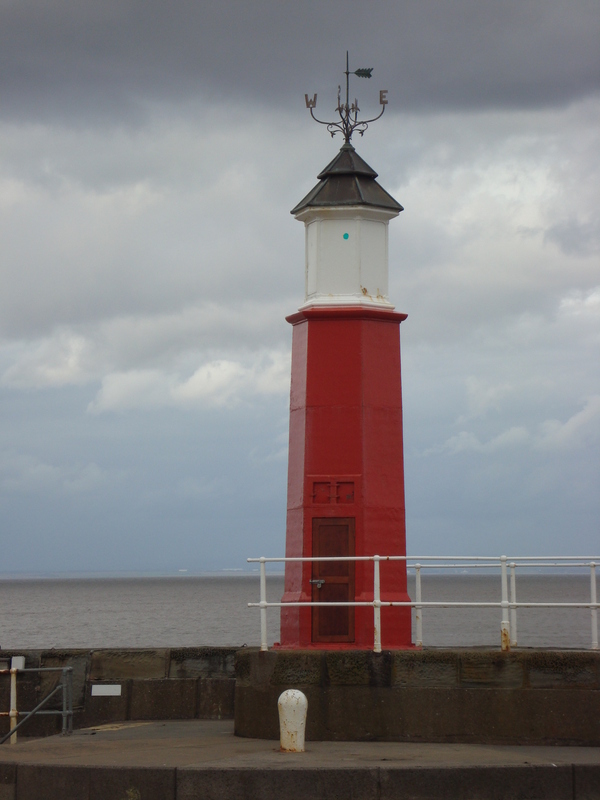 I’ve never been likened to a lighthouse before. Although, many have correctly noted that the light is often on, but there’s rarely anybody home 😉 Congratulations on your nomination, and thank you for thinking of me. I am pleased that you see it like that, and not just an “oh how we go again” kind of affair which is how many receive it, not that you can blame them. Well, what’s not to love about lowering the tone, ha! So long as you can come over to this ‘pad’ – love it! – and find shelter and lots of fun beneath my magical umbrella, and Jenny Jen Jen too if she comes back, then that is the main thing. Just remember though to watch out for the pointy end….oops, I hope others reading this don’t take that the wrong way ! !